Extended Entry: The original post has now maxed with 5,000 Entries on the giveaway. Please post any new entries / additional entries here. The entries will be combined (and will remain in original order) when the winner is drawn. You can view the original post & entries HERE. Please make sure to cut & paste the new bit link for your daily Tweet entries. Thank you for your participation. The new Flip UltraHD video camera combines Flip Video's signature shoot-and-share simplicity with the power of HD video. UltraHD could not be easier to use: just power on, press record, and you'll be capturing incredible HD. UltraHD features 1 hour of record time and included standard AA batteries, so you'll never miss another minute of video again. With its pocket-sized design, UltraHD lets you capture video anytime, anywhere. Whether it's a lazy afternoon in the park, a family vacation, or a simple everyday moment, your UltraHD will be ready to go. And show off your personality with the Ultra colorful lineup; brilliant white, vibrant magenta and metallic blue. UltraHD combines signature Flip Video quality with HD 720p resolution and 30 frames per second to offer vibrant HD video. And with 4 GB of built-in memory, UltraHD lets you capture up to 1 hour of HD video with no additional memory cards. UltraHD thrives in all types of lighting environments, and with premier AAC audio your videos will sound simply amazing. Plus the included HDMI™ output makes it easy to enjoy your videos on your HDTV. I'm a mom. So, naturally I'm an obsessive (somewhat pathological) picture taker. I love to capture all of the special moments, and the not so special moments, and my little cherubs just breathing and being cute on our camera. Although we have a camcorder (that's fairly compact) for some reason, it seems to be too much hassle to carry it around with me everywhere, so the video that we've captured in the past is sparse to say the least. UltraHD! It comes with everything preloaded in the handheld video camera. 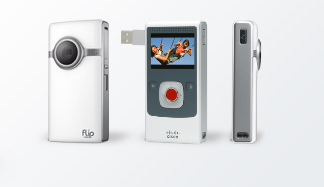 With simple functions (Play, Delete Record, and Power Buttons), and brilliant video quality.....all you have to do is plug the camera directly into the USB port on your computer (the USB flips out from the side of the camera no cords required!) and the preloaded software automatically uploads , and allows you to edit & share your video! Very easy, very quick! Best of all? The video is crisper, and of better quality than our handheld camcorder! Being that the Flip UltraHD is the size of my camera, its super easy to bring it along in my purse everywhere! When something catches my attention, and I want to film I don't have to fuss with a bunch of buttons or settings; I can power on the flip and hit the red record button. Yes, ITS THAT SIMPLE! 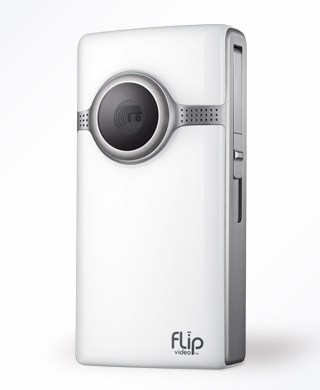 Every mom should own a Flip! To catch all of those fleeting moments & precious memories! 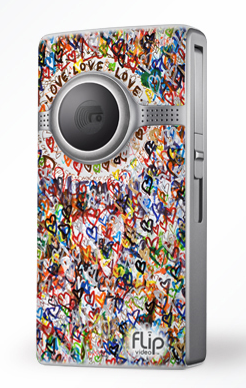 The Flip Ultra HD would make the perefect Holiday Gift! Capture every moment with the brilliance of The Flip Ultra HD! One lucky reader will receive a 4GB Flip Ultra HD! Visit http://www.theflip.com/ and let me know another feature you love / another product that you would love to gift/receive this Holiday Season. The comment is considered your entry. 2) Tweet ~ #WIN 4GB Flip Ultra HD! Capture every moment with the brilliance of HD! @savvycouponmom http://bit.ly/fpxtja #GIVEAWAY #Holidays (can be repeated twice daily for additional entries~ copy paste please~cut and paste- the bit link must be posted in the tweet - I will check) (Additional 5 Entries - 5 Comments).